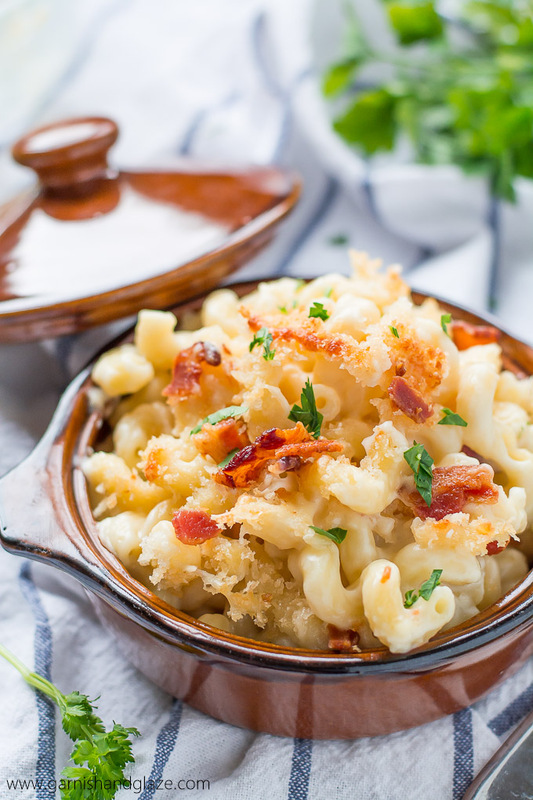 5 Cheese Mac & Cheese topped with extra cheese, crispy Panko bread crumbs, and bacon is the ultimate comfort food! Winter is all about comfort food that makes you feel all warm and snuggly. 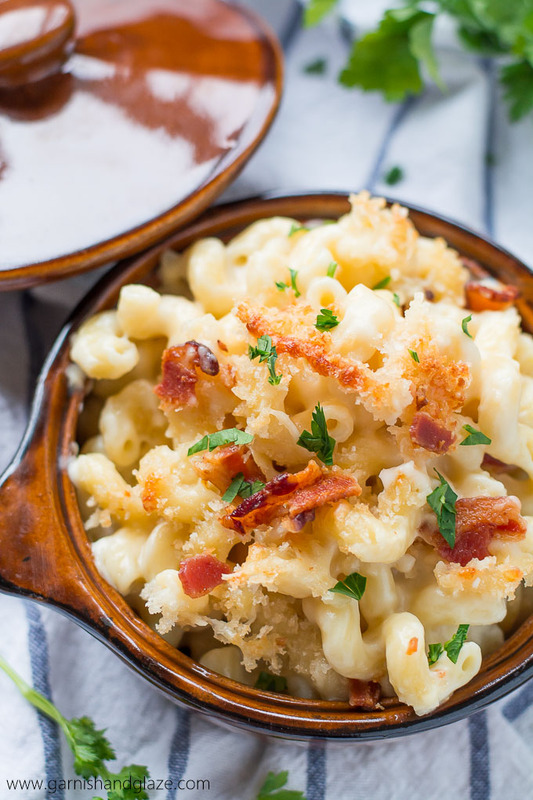 This 5 Cheese Mac & Cheese does just the job! 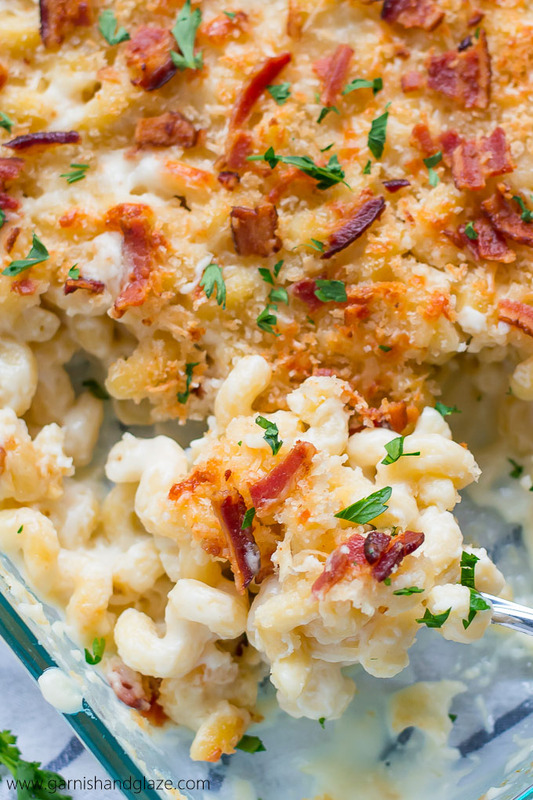 Oh my, you will never taste a mac & cheese as amazing as this! 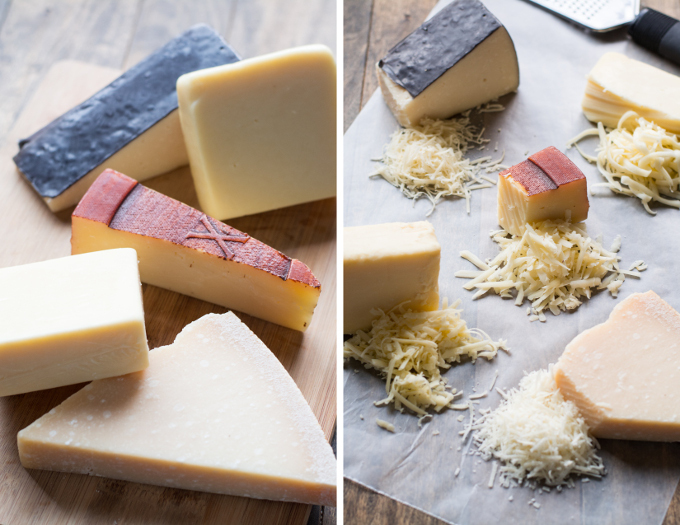 This sauce is made with 5 white cheeses– Fontina, white cheddar, Asiago, Parmesan, and Swiss. No lack of flavor and creaminess here! You could stop there and enjoy the pasta covered in cheesy sauce but who wouldn’t want to top it with extra cheese, crispy Panko, and salty bacon?! Drooling. You can really use whatever noodle you want in this dish. Cavatiappi is a fun noodle but elbow macaronie is pretty similar. Shells are also great because they hold the sauce really well. If you’re looking for a side to go with this dish I always enjoy broccoli but you could serve green beans or a salad too. Enjoy this ultra comforting pasta! There’s no better way to end your day… okay, maybe if you add some sort of chocolate dessert like a molten chocolate lava cake. Now we’re really talkin! Mmmm! Preheat oven to 450 degrees F. Grease a 9x13 inch pan with butter. Meanwhile, in a small mixing bowl, combine 1/4 cup fontina, 1/2 cup white cheddar, 1/4 cup asiago, 1/4 cup Parmesan, 1/4 cup Swiss, and Panko. Set aside. Cook bacon in a large pot until crisp. Remove to a paper towel lined plate and crumble into pieces when cooled. Add butter to the bacon grease in the pan and melt over medium heat. Whisk in the flour and cook for 2-3 minutes to make a roux. Add the salt and mustard. While stirring, slowly stream in the milk, whisking constantly while cooking until it thickens (5-7 minutes). Stir in the remaining cheese (1 1/4 cup fontina, 1 cup white cheddar, 1/2 cup asiago, 1/2 cup parmesan, 1/2 cup swiss) until melted. Add the sauce to the pasta and then pour into the pan. Top with the Panko/cheese mixture and bacon. Bake for 15-20 minutes until golden brown and bubbly. Let it rest 5-10 mintues before serving. Serve sprinkled with parsley. Yum. 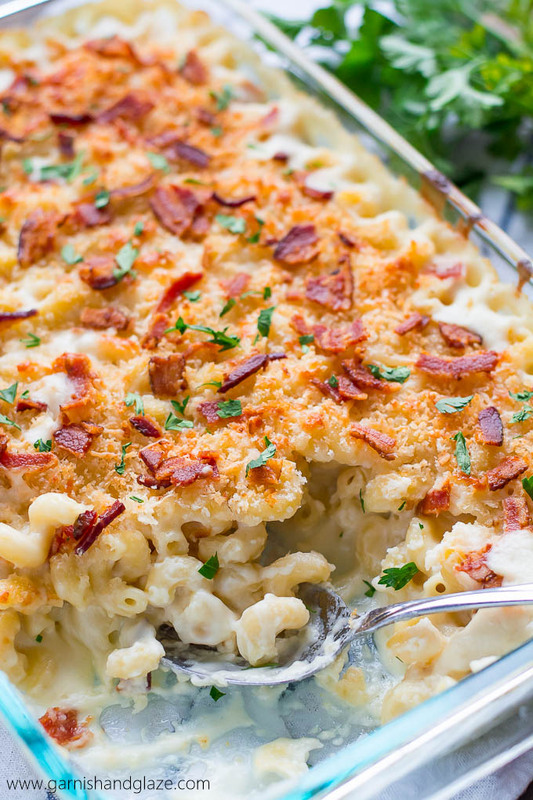 I am so craving mac and cheese right now! 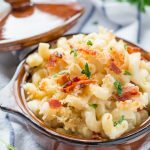 Fannie Farmers Mac n Cheese has always been my go to recipe but I saw your recipe and had to try it! It did not disappoint! My husband and I loved it! 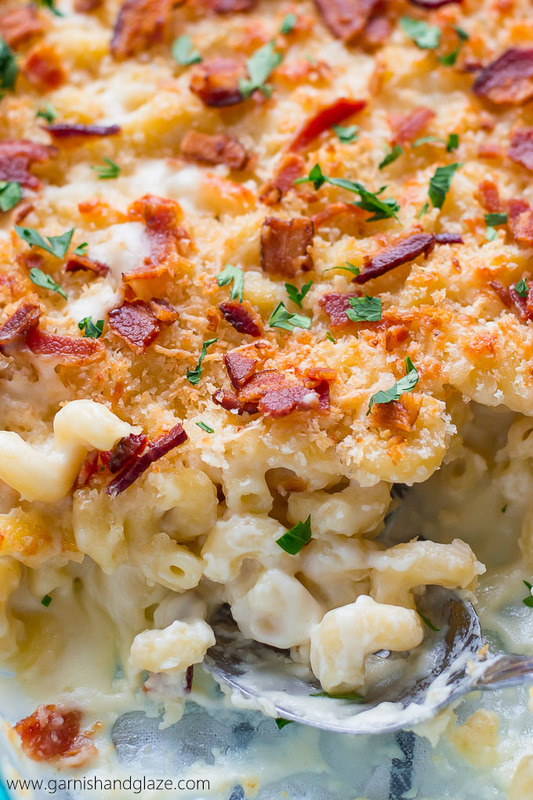 It has become our new favorite Mac n Cheese! Thank you for posting! It is wonderful! That is so awesome to hear! Glad you both loved it! Thanks Jamie! The consistency of my mac and cheese was too dry. I would prefer a creamier sauce. Tasty, but I was a bit disappointed. Laynie, Sorry to hear you were a bit disappointed with it. Next time add more milk to your sauce to make it runnier. Baking the macaroni is what makes the sauce thicken so if your sauce is thinner/more liquid it won’t come out as dry. Or maybe try making more sauce or using less pasta so then you have a higher sauce to pasta ration.